Ever wondered how much a Dense Chestpiece actually reduces explosive damage or how much energy damage Tesla Bracers really add? Then give this mod a try and see the actual numbers instead of vague descriptions! Mcgan: Creating the Power Armor Materials AND Paints, for which a compatible BAMD version has been made. etisvoloch: Pointing out the descriptions error in some Power Armor Titanium Plating and Metal Torso Padded and Dense mods. johndoebowler: Creating the Craftable Armor Size mod, for which a compatible BAMD version has been made. ZephyrWarrior: Creating the ZephyrWarrior's F4 Power Armor Overhaul mod, for which a compatible BAMD version has been made. JotaEme88: Pointing out the description error in the Chameleon legendary effect. Mudcupss: Creating the showcase video. LostVampire: Translating BAMD into German. Gambit77: Creating the Armorsmith Extended mod, for which a compatible BAMD version has been made. Muleke: Translating BAMD into Brazilian Portuguese. comodo99: Pointing out the description error in ZWF4PAO's T-51 Optimized Leg Servos. Game0rb: Creating the showcase video. Tyrannicon: Creating the showcase video. midian182: Writing the Mod of the Week colum entry on BAMD. valckye: Translating BAMD among others into Brazilian Portuguese. Mateodon: Creating the More Weaves - No Railroad mod, for which a compatible BAMD version has been made. HSneak: Translating BAMD into French. nestquik: Translating BAMD into Russian. Worsin: Creating the Worsin's Immersive Power Amor Garage (WIPAG) mod and making it compatible with BAMD. TheTalkieToaster: Creating the More Power Armour Mods mod, for which a compatible BAMD version has been made. MadMAX713: Creating the Raider Overhaul WIP mod, for which a compatible BAMD version has been made. gokuGX: Creating the Legendary Modification Enhanced mod, for which a compatible BAMD version has been made. SephDragoon: Creating the Rsearch Projects - Advanced Technology mod, for which a compatible BAMD version has been made. Added better descriptions for all Automatron armor, including robot armor. Corrected installation paths, should now work in Mod Organizer (MO). Added Nexus Mod Manager (NMM) Support. Fixed some more errors (thanks to etisvoloch yet again). Gone over all descriptions, fixing several small description errors. Minor description fix for Chameleon legendary effect (thanks to JotaEme88 for pointing it out!). Corrected the descriptions of some Metal Torso Padded and Dense mods from -50% Explosion Resistance to -50% Explosion Damage taken. Thanks to etisvoloch (again) for pointing this out! Corrected the descriptions of some Power Armor Titanium Plating from +10% Base Health to +10% Base Durability. Thanks to etisvoloch for pointing this out! This Update only affects compatibility version of Better Armor Mod Descriptions. Compatibility versions now only modify the armor modifications that are actually changed by the to-be compatible mod. You now need the main file as well as the compatible version. Load Order should be: Main File followed by Other Mod followed by Other Mod Compatible BAMD File. Pro: This means that it'll be easier to make compatible versions and some cross-compatiblity becomes possible as long as the other mods don't modify the same armor modifications. Con: This means you'll need an additional (but smaller) ESP file for each compatible mod you're using. I believe the above pro outweighs this however. Better Armor Mod Descriptions is no longer being supported as it has been merged with Better Weapon Mod Descriptions into a single mod: Better Mod Descriptions. This merged mod includes both weapon and armor mod descriptions. Update v1.2: Added Nexus Mod Manager (NMM) Support. Fixed some more errors (thanks to etisvoloch yet again). Update v1.2b (01.04.2016): Added better descriptions for all Automatron armor, including robot armor. Minor Update (04.04.2016): Corrected values in some robot head mods' descriptions (+100%, not +200%): Gorgon Helm (Assaultron Laser Damage), Gloom Helm (Explosive Limb Damage), Cyclops Helm (Mesmetron Damage), Berserker Helm (Limb Damage), Lament Helm (Explosive Limb Damage), Butcher Helm (Limb Damage) and Space Monkey Helm (+50% Energy Damage, not +150%). > German Translation available, as translated by Lostvampire. Thanks a lot! > Brazilian Portuguese Translation available, as translated by Muleke. Thanks to them too! > Brazilian Portuguese Multi-Mod Translation, combining Better Armor Mod Descriptions and Better Weapon Mod Descritpions (translated by Muleke) with Legendary Modification and Crafting Workbenches (translated by valckye). Thanks to the both of them! > French Translation available, as translated by HSneak. Thanks here too! > Russian Translation available, as translated by nestquik. Thanks! > Update file compatible with Mcgan's Power Armor Materials AND Paints v1.1 available. > Update file compatible with johndoebowler's Craftable Armor Size v1.3.0 available. > Update file compatible with ZephyrWarrior's ZephyrWarrior's F4 Power Armor Overhaul v0.9.7.2 available. > Update file compatible with teaLz's Legendary Modification v1.75 available. > Update file compatible with Gambit77's Armorsmith Extended v2.91 available. > Update file compatible with Mateodon's More Weaves - No Railroad v1.2 available. > Is compatible with Worsin's Immersive Power Armor Garage (WIPAG) by Worsin. Check it out at that mod's page! > Update file compatible with TheTalkieToaster's More Power Armour Mods v1.1 available. > Update file compatible with MadMAX713's Raider Overhaul WIP v9.2 available. > Update File compatible with gokuGX's Legendary Modification Enhanced v1.3 available. > Update File compatible with SephDragoon's Research Projects - Advanced Technology v0.9 available. Ever wondered how much a Dense Chestpiece actually reduces explosive damage or how much energy damage Power Armor Tesla Bracers really add? Then give this mod a try and see the actual numbers instead of vague descriptions! 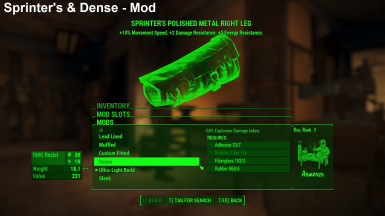 Similar to Better Weapon Mod Descriptions, this mod strives to bring clarity to your armor mods by changing the descriptions of almost all armor mods, including normal armor, power armor and legendary armor effects. As such, BAMD unfortunately will not be compatible with any other mod that modifies any armor mod. It leaves all values at their vanilla setting and merely lists them all - including some which weren't actually noted in the old descriptions but still present. Old Description: Increases VATS hit chance. We know what it does. But how much? New Description: +10% VATS Accuracy. Just good old fashioned numbers: 10%. 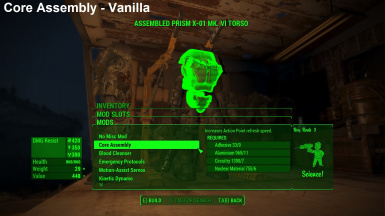 These kinds of changes have been applied to all armor mods (including legendary mods, normal armor mods and power armor mods) in the game, revealing actual numbers for those who like their descriptions actually, well, descriptive. Would you rather read an article in a Fallout 4 Mod of the Week column? Check out midian182's post here. Has been translated into: German by Lostvampire. Check it out! Has been translated into: Brazilian Portuguese by Muleke. Check it out! Has been translated into: Brazilian Portuguese by valckye and Muleke. Includes a number of other mods too! Has been translated into: French by HSneak. Check it out! Has been translated into: Russian by nestquik. Check it out! Has been made compatible with: Power Armor Materials AND Paints v1.1 by Mcgan. Check the Update Files! Has been made compatible with: Craftable Armor Size v1.3.0 by johndoebowler. Check the Update Files! Has been made compatible with: ZephyrWarrior's F4 Power Armor Overhaul v0.9.7.2 by ZephyrWarrior. Check the Update Files! Has been made compatible with: Legendary Modification v1.75 by teaLz. Check the Update Files! Has been made compatible with: Armorsmith Extended v2.91 by Gambit77. Check the Update Files! Has been made compatible with: More Weaves - No Railroad v1.2 by Mateodon. Check the Update Files! Has been made compatible with: Worsin's Immersive Power Armor Garage (WIPAG) by Worsin. Check that mod's page! Has been made compatible with: More Power Armour Mods v1.1 by TheTalkieToaster. Check the Update Files! Has been made compatible with: Raider Overhaul WIP v9.2 by MadMAX713. Check the Update Files! Has been made compatible with: Legendary Modification Enhanced v1.3 by gokuGX. Check the Update Files! Has been made compatible with: Research Projects - Advanced Technology v0.9 by SephDragoon. Check the Update Files! Better Armor Mod Descriptions is not compatible with any mod that changes any values of armor modifications. This doesn't include custom textures, sounds etc., only the actual statistics and values. BAMD could be made compatible with any such mod with a small bit of work, just leave a request. -Armor Mod descriptions may appear fairly small due to increased text length. This cannot be changed unfortunately. Sorry if you find reading small text difficult! when deleting or updating/renaming multiple .esps! To install this mod, simply place your chosen .esp into the Fallout 4/Data folder. If this line is already present but ends in 0, simply change it to 1.
to add it to your load order, found under AppData/Local/Fallout4/plugins.txt in your User folder. Add a new line with your chosen ESPs full name (e.g. ConsistentAluminium.esp) and save the file. It should now load the mod if it it placed in your Data folder. To uninstall this mod, simply remove the ESP from your Fallout 4/Data folder.